The ribs are fragrant and sticky, and they prove how easy Asian cooking can be. 1. Preheat the oven to 170°C, gas mark 3. 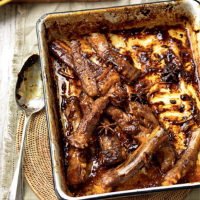 Put the pork spare ribs in a roasting tray. Mix together the orange juice, soy sauce and honey, then stir in the ginger, star anise and garlic. Pour over the ribs and cover with foil. Bake for 2 hours. 2. Remove the foil and increase the heat to 220°C, gas mark 7. Cook the ribs, turning and basting regularly, until golden and bubbling, about 45-50 minutes. Serve with steamed greens and rice.